I consider myself to be a true southerner - not only are both of my parents from Atlanta, but so were their parents... and their parents... and their parents... I think both sides of my family have been traced back to the 1700's, and they have been in Georgia ever since. So even though I consider myself a bit of an expert in southern cooking, prior to last summer I had never heard of tomato pie, much less tried it. And how I went 28 years without trying it, I'll never know - because this stuff is life-changing. I was first introduced to this pie by my friend Jenn of Bakin' and Eggs. I made this toward the end of last summer, and it automatically went on my list of favorite things. As soon as tomatoes started coming into season this year, I knew I wanted to make this again. But in the meantime, I came across a similar recipe from Smitten Kitchen, so I decided to combine the two and make my own version. This is a bit of a time-consuming recipe, but the results are so so worth it. First you have to peel the tomatoes, slice, drain, then make the crust, cut the corn off the cobs, shred the cheese, and finally assemble. But we ate this for dinner one night, then I enjoyed it for lunch over the next several days. So you definitely get to reap the benefits of your hard labor for several days. And none of the steps are challenging or particularly time-consuming. You start with a buttery, flaky, biscuit-like crust, and start layering sliced tomatoes (peeled first - no icky skins! 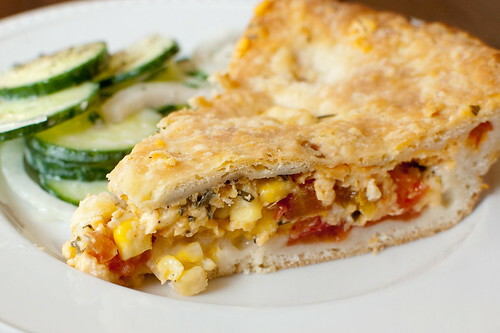 ), fresh corn, and a garlicky, cheesy, herbaceous filling between the layers. Top it with more of that awesome crust, bake, and enjoy! I served this as a vegetarian entree with a cucumber salad and sliced watermelon, but you could certainly have it as a side to some grilled chicken, steak, fish, etc. I'm already looking forward to making this again in the coming weeks - it's not often that I repeat recipes, but this one is definitely a winner! To make the crust, whisk together flour, baking powder, and salt in a bowl, then blend in cold butter with your fingertips or a pastry blender until it resembles coarse meal. Add the buttermilk, stirring until mixture just forms a dough, then gather into a ball. Divide dough in half and roll out one piece on a well-floured counter into a 12-inch round. Either fold the round gently in quarters, lift it into a 9-inch pie plate and gently unfold and center it or, roll the dough around the rolling pin and transfer to the pie plate. Pat the dough in with your fingers trim any overhang. 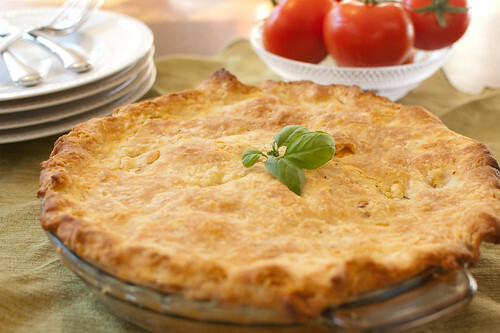 Place the pie plate in the refrigerator to chill while you prepare the filling. Wrap the second half of the dough in plastic wrap and chill as well. Bring a large pot of water to a boil. Cut an "x" in the bottom of each tomato. Have a large bowl of ice water ready, then add the tomatoes to the boiling water. Cook for about 10 seconds then transfer to the ice water. When cool enough to handle, peel the skins from the tomatoes. Line a baking sheet with a double layer of paper towels or a lint-free kitchen towel. Cut the tomatoes into 1/4-inch slices and arrange in a single layer over the paper towels. Sprinkle generously with salt and allow to stand at room temperature for 20-30 minutes. Blot the tomatoes with more paper towels (or another kitchen towel). Mix together the mayonnaise, cheeses, garlic, and lemon juice. Season with salt and pepper to taste. Remove the pie crusts from the refrigerator. Layer half the tomatoes on the bottom of the pie, gently removing extra seeds from some of them (there's a lot of flavor there, so I didn't remove all the excess liquid, maybe just from about half to two-thirds of the tomatoes). Scatter half the corn over the tomatoes, then drop spoonfuls of the cheese-mayo mixture over the top. Sprinkle with half the basil and chives, then repeat the layers: tomatoes, corn, cheese, herbs. Roll out the second pie crust into a 12-inch circle. Fit over the filling, pinching the edges of the two crusts together to form a fluted edge, or use the tines of a fork to fit together. Use a small knife to cut 4 slits in the top of the crust, then brush with melted butter. Bake pie until the crust is golden and the filling is bubbling, 30-35 minutes (place a cookie sheet on the rack below the pie in case any of the filling boils over). Allow to cool 10-15 minutes before cutting into slices and serving. This looks awesome. Not healthy, but awesome. I have never been to the south but you make me really want to visit! You had me at herbaceous filling...YUM! This sounds super yummy. Great creation! I was just thinking today that I haven't had tomato pie in forever and have never made one. It's fate! I'll be making this recipe over the weekend. Thanks, Josie! I swear, we share a brain. I just made this from Smitten Kitchen last week. We enjoyed it but I felt like it needed something...maybe I'll try your version to compare!